This week on Food Talk with Mike Colameco, Mike is joined by Jeff Harding, beverage director and sommelier for the Waverly Inn. Harding has worked in the hospitality industry for more than 20 years, as a server and bartender with such chefs at Daniel Boulud and Norman van Aken. Harding got his start in the hospitality industry working as a server at van Aken’s a Mano in Miami Beach, and it was during this time that he first discovered that food and wine culture was a reflection of history, geography, and regional culture. A move to New York, and too many years bartending at the B Bar in Manhattan’s East Village, encouraged Harding to pursue sommelier training at the American Sommelier Association and beverage management positions. 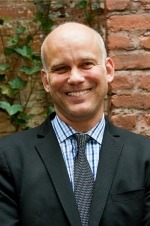 He currently writes a regular column about wine for StarChefs.com, and is the beverage director at the Waverly Inn.